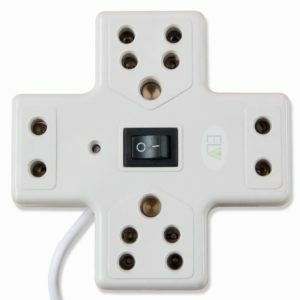 Amazon is here with a great deal offering ELV Extension Board 6 Amp 4 Plug Point with Master Switch, LED Indicator, Extension Cord (4.8 Meter) – White at Rs 251 only . Grab it Now..!! How to Buy ELV Extension Board ? PRODUCT SPECIFICATIONS: One Master Switch, 6 Ampere – 240V in Total, AC Only. HEAVY-DUTY 4.8 METER CORD: It’s heavy-duty design helps protect the cord from damage and ensures optimal power flow to your devices. 4 SOCKETS FOR NON STOP PERFORMANCE: Four Sockets for Non-stop Performance Whether you have a TV or computer, printer or scanner, music system or emergency light, It works well with all your digital devices, The neatly designed sockets accommodate the power points of your devices and ensure that each device gets the proper power flow without any fluctuation. PREMIUM MATERIAL: It is a well-designed product on the Indian market, It is elegant and nicely engineered, It has a plastic body and strong cord.